All events in place Crikvenica ! Surface : 65 m2 (Ground floor). Surface : 65 m2 (1. floor). Environment: Ability to use barbecue, parking provided. Other options: Pets are not allowed, air conditioning, owner lives in the house or near the house, washing machine at the landlord. Price options: Tourist tax is included. Check in: 14:00 pm, Check out: 10:00 am. Prices are the total price for building / apartment on the day. Included are: utility fees in regular ratio of consumption (electricity, water, gas), weekly change of sheets and cleaning. Children under 3 years of not using separate beds are not included. Fee per child is € 3.5 per day. The fee is payable on arrival at the agency. Air conditioning, 7 EUR per day Using the air conditioner is charged separately Consumption of electricity, gas and water included. Registration is not included. Is 5 EUR per person (Single) For stays shorter than 4 days will be charged 30% add-on price. Final cleaning included in the price. Paul monastery - now a hotel, "Kastel"
The former monastery - tower in Crikvenica is situated in the eastern part of Crikvenica, between two roads, and between the sea and the River Dubračine. Initially, the whole area was surrounded by a wall whose remains are visible today. Dobracina At the mouth, with the chapel of the Blessed Virgin Mary, the 1412th The Frankopani built a monastery as their foundation. This is a great round tower structure was determined, with an indoor courtyard and a large water tank. The monastery inhabited by Pavlin, until the abolition of the Paulist order 1786 years, when he became the center Vinodolski kaštelanata. Double decker complex of monasteries and churches are closed circuit around the inner courtyard. The church was reconstructed in Baroque style, with Gothic vaulted sanctuary. On the north wall of the church continues to be the cloister in which there are two head tanks. The interior layout of the monastery fits its original function: a simple small room, narrow hallways, refectory, library, etc. Unfortunately, the monastery is quite degraded by adapting and upgrading was conducted for the accommodation of the hotel. In Dramlju, on the coast, on plot Pazdehova in jednoprostornom stone house, open stropišta and roof covered with water on two channels, the mechanism is located Pierrot - olive mill. His parts were mostly wooden, with partial subsequent interventions in the iron. It consists of movable and immovable inventory for the milling and pressing of olives, fixed on the ground and beams stropišta. The integrity of both the facility and inventory is sufficient, and it clearly testifies to the strong tradition of olive growing as an industry, characteristic for the Adriatic region. This object symbolically unites some typical elements of traditional culture XIX. century and earlier, in this region: in typical architectural solution of the Adriatic stone construction, primarily fishermen`s houses, situated in the plant olive mill, and thus describes a segment of life. Museum was established in 2008. g with the task of collecting, preserving, documenting, studying and presenting the cultural heritage from the City of Crikvenica and its surroundings. Data of Interest collected through field research, by gift or purchase, and all items are kept and stored in the storerooms of the museum. City Gallery is located in the city center and runs throughout the year. The gallery can be viewed artwork by acting on crikveničkome area and in other regions, even overseas. The main goal of the gallery is to introduce visitors to the contemporary visual arts and discover the richness of the diversity of artistic expression, which the authors offer a new and unique worlds. A bronze statue of the fisherman's work of the sculptor Zvonko Cara.Kip is located in the city's harbor and is made in memory of fishermen and rich tradition of fishing. Sv. Jelena was built in place of the old Dramlja kapelice.Godine 1796th Rijeka is a famous artist Giuseppe Capovilla for her by the marble altar. St. Helen's Parish was founded in the 1809th year, while the Parish House and the Church of St. Helen built after the 1812th year. In 19th century decorated interior of the church, 1837.propovjedaonica and 1845th altar. Archaeological site Lokvišće Jadranovo originated with Stove is the perfect place to look for the lost peace and healing of body and spirit. Specifically, in the bay next to Lokvišće Jadran is known and mud, a kind of natural phenomenon for the treatment of rheumatic diseases. Arih Romans and is the oldest monument in the city. Sv. James the Apostle in Jadranovo was built in the first decade of the 19th stoljeća.Pretpostavlja to be built in etapama.Tunera Jadranovo is a symbol of the rich fishing tradition in the town and one of the few that had remained in the Bay. Chapel St. Catherine Selce is hidden in a small green park, and is assumed to have originated from the Romanesque era. Already in the 15th century was very run-down, and after repairing the 1498th year was re-consecrated Bishop Modruš. Adrenalin Park is located near the city center, situated in a beautiful forest. An excellent opportunity for an unforgettable experience. Whether for children or for adults who want adrenaline and fun park offers a variety of content (great trails for climbing, cageball cage for the game and summa-Aerotrim spinroller). Badanj is the oldest monument of medieval architecture in Vinodol, located near Crikvenica. The original name is not known forts, abandoned after an earthquake in the 14th century. Part of the military garrison was probably moved to the nearby village dogfish, and oversight functions over the mouth of the river has taken Dubračine ancient Kotor.Badanj fort is an irregular circular ground plan, and consists of a large central tower, which houses the living quarters crew and reservoirs. By the central tower could only be accessed through a narrow circular procession, which was surrounded by a strong wall, partially reinforced rectangular buttresses. With the winding access road is lower town with more rectangular housing.Isolated finds of ancient bricks embedded in the walls of Christmas can mean that the core works appeared in the twilight period of antiquity, that ranobizantskome age, between 4 and 6 century. At the foot of Christmas, over Dubračine left bank, are the ruins of the church of Sv. Spirit on Duševu, built in the 12th century and restored in the 15th century, situated next to a medieval cemetery, formed after leaving early Croatian cemetery in the village of Gorica strangers. Little town of Drivenik is located near the castle of the Frankopans, one of the very few that are preserved, which offers view of the northern part of Vinodol. The citadel of Drivenik is uninhabited; all inhabitants moved to the foot of the hill. On the hill remained a lonely castle from the 13th century, St. Dujam’s parish church, St. Stephen’s Church from the 15th century, parish house and an old school which was attended by many generations of people from Drivenik. The castle of Drivenik was once entered over a hinged bridge stretching over a dug up moat. The castle was defended by high walls, four corner towers and a semicircular bastion. THE CASTLE : Once upon a time, the castle of Drivenik was entered over a mobile bridge built over a dug-up moat filled with water. Great castle in the shape of a square was defended by high walls and four round corner towers, as well as a semicircular bastion. Wooden corridor built for defense purposes was located in a high place around the walls. At the end of the corridor was the door which led into corner towers, and the stairs from the towers led into the inside of the castle. Within the castle there were tenements, magazines, basements and a water tank. Drivenik is mentioned in Vinodol Codex dating from 1288 – the signatories of the Codex were, among others, people of Drivenik. One of the most beautiful beach is a beach Spruce, located in front of the hotel. The beach is gravel with paved areas and easy access to the sea. On it you can rent umbrellas and deck chairs. There is also a bar which offers light meals, ice cream and various kinds of soft drinks. Above the beach there is a green belt where you can take shelter during a major temperature. For all who want to recreate, there is also a tennis court which is located just above the beach. Beach Spruce is an ideal choice for families with small children, and all who want to comfortably enjoy the beautiful sea. One of the most famous beach in Crikvenica beach is black mole that is located in the attractive part of town, surrounded by numerous bars and hotels. The beach is sandy and suitable for families with children and youth. On it you can rent umbrellas and deck chairs and various equipment for water sports. The beach is organized hour of aerobics, which attracts many customers are looking for fun and activities at sea. Aquarium Crikvenica is located in the city center, in an area of 200 m2. The pleasant ambience of the aquarium there are 24 pools that its appearance resemble the natural habitat. They are inhabited by over a hundred species of fishes of the Adriatic and fifty copies of marine tropical fish. 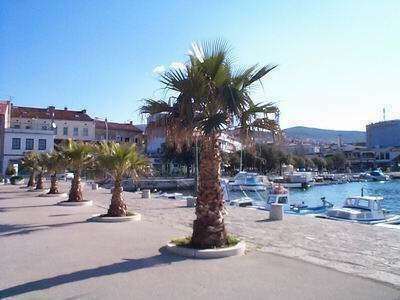 For the first time in Croatia, Crikvenica will be able to see the aquarium fish, tropical seas. Oko 1890. he began an affirmation of Crikvenica a famous health resort, and the construction company for health resort and public beach Crikvenica raises hotel Therapiju "most modern at that time. Building of the Hotel Tyrol is the oldest and most representative health resort hotel facility in our area which is continuously since the time of construction 1897th year (Budapest architect S. Höfler). The purpose of the facility has set his accommodation in relation to the settlement of Crikvenica, its volume, and the internal layout and architectural raščlanjenje and treatment fronts. Surrounding buildings cultured in high quality park subtropical vegetation. The weight of the object is broken down into several elements, and the main central part of the prominent elements on both sides is a small building of a pavilion-type side. The front of the building facing the sea is rich in broken loggias, balconies and terraces. In this way, health resort and hotel function object reflected in its external appearance. Lover's Walk is one of the most beautiful promenades in this area and so the name suggests is designed for couples in particular because it exudes a special romantic notom.Šetajući through this beautiful forest, you can hear only the chirping of birds and their steps because although near enough away for a moment escape from the summer heat and crowds.